It’s no accident that I became a mechanic in the auto repair business. It all started with my first big block model engine project. My father bought me this kit when I was about 8 years old. He wanted me to learn how things worked. He thought that it would be an important life skill to be able to fix things including my own car when I was older. My Mother tells people a different story. She says he pushed me into being a mechanic so he could get his cars fixed for free. Not sure if my Mom was right but it did work out that way. In fact I not only fix the cars of the entire family for parts cost only but I also replaced the engine in my Dads 26 foot boat. So it worked out well for him. 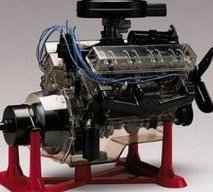 The same exact 1/4 scale big block model engines kit that dad bought me is still available today. I wrote a detailed review for the model engine kit by Revell for the you fix cars website if you’re interested in something like that. Note that it can be challenging to put together and is recommended for humans over the age of 12. It’s a working model that you can see inside! The see through V8 Engine features moving pistons and connecting rods. A hand crank moves the crankshaft, rods and pistons. A timing chain moves the camshaft, rocker arms and valves. The kit includes a rubber like fan belt and vinyl ignition wires. This model engine kit is a superb educational tool on the inner workings and construction of a V-8 engine. I decided to put together a collection of my favorite engines of all time. I bought a 427 Ford Wedge model after first seeing it at a friend’s house on display. A local hobby shop retail store had it for $32 but I found it on Amazon for about $15. It is very detailed and one of the easier models I have assembled. One thing I really liked about it was there is no painting required. I always hated painting models when I was younger and still don’t care for it much today. The big block engine model goes together pretty quick but I did have to file down a few rough edges but nothing major. Also worth mentioning, a few of the chrome parts where slightly nicked up but again nothing that anyone else can see but me. Other than that it was easy to assemble with no problems at all. This is what I would consider a beginner skill level model kit. I do not think that advanced model builders would be too interested in this project. For me I am putting together a display of all of my favorite and historic engine models. My mechanic friends are going to love it when they come over to visit. The 427 Ford big block model (available below) was not too involved and this was perfect. It took me about a week working here and there. Not only was it cheap and fun to put together it is also a nicely detailed piece for my display. Would any quality display of engine models be complete without the 426 Hemi dodge big block? This happens to be my favorite engine of all time. My first car was a Dodge charger. My father made me get a small block car because he thought I would get killed in a big block car. But a kid at my school had a Hemi charger with the historic 426 big block. He took me for a death ride that I would never forget. Riding in this Charger was like being on a roller coaster ride! It plastered you back in the seat like you where launching from the deck of an aircraft carrier. His Hemi charger could pull the front wheels of the ground with slicks mounted on the rear axle. So to preserve the memory I added the Hemi to my collection of 1/4 scale engine models. I got the Lindberg Super Stock Dodge die cast model kit. It is a quality replica of a drag racing engine from the 60’s. They say it is duplicated from factory parts to maintain historical accuracy. I can tell you it is a detailed replica that is already painted and ready to assemble plus it has die cast parts and the stand is included. To me this big block engine model was also a near beginner skill level and it went together quickly. Here are links to some of the 1/4 scale big block engine models I have built and displayed. For more of the latest articles posted to the auto repair information blog this next link will take you back to the home page.